January 24th, 2011: Surprise! We found out we were expecting our second child. My husband and I were both very excited and we called our parents right away to share our news. I then called my doctor to schedule my first baby appointment. We were scheduled for February 22nd. I had the usual pregnancy symptoms; extreme fatigue, nausea and roller coaster emotions. I ended up feeling like I was getting a urinary tract infection (UTI), so I called my doctor. At this point I was 5 weeks and 3 days pregnant. Because of the UTI my doctor wanted to see me, and as a precaution she scheduled an ultrasound. The ultrasound tech said that the baby was only measuring 4 weeks. I was concerned but my doctor said that it was perfectly fine at this point. February 22nd 2011: We had our first baby appointment. I was so excited and nervous. I was almost 9 weeks and I couldn’t wait to hear the heartbeat. As the tech performed the ultrasound she was really quiet and asked how far along I was supposed to be, “Almost 9 weeks “I told her, she said “the baby is only measuring 6 weeks 2 days”. She began to look for the heartbeat and there it was just flickering away, she measured it and it was beating 80 bpm. We didn’t get to hear the heartbeat, but we could see it. At this point I was concerned, my baby was measuring over 2 weeks late. I was encouraged that there was a heartbeat, but I was still nervous. My doctor came in to talk to us and asked what I thought about the ultrasound, I said that I was worried and she said that she was too. She said that there had been growth since my last ultrasound and that there was a heartbeat, so that was encouraging. She also said that it was possible that I had ovulated really late and that was why the baby was measuring small. Nonetheless, she was still concerned and wanted to schedule another ultrasound for the following week to make sure the baby was growing. We scheduled our next appointment for March 4th. Over the next week and a half I worried constantly. I tried to tell myself not to worry and that everything was fine. There was a heartbeat, so there was hope. Finally the day I had been waiting on was here. March 4th, 2011: This is a day I will never forget. We arrived at the doctor’s office and didn’t have to wait long before we were taken back for our appointment. I crawled up onto the examine table and my husband Freddie held my hand. My heart was in my throat and I was so nervous. As soon as I saw the baby I knew things didn’t look right; as the ultrasound tech measured the baby my fears were confirmed, the baby was only measuring 6 weeks 2 days. The baby had not grown. She measured several more times, and still the measurements were the same. She then began the search for the heartbeat. I didn’t see anything. She asked me to hold my breath several times to see if she could find it, but she couldn’t. She said “You know I’m having trouble finding the heartbeat”, I said “yes ma’am”. At this point I started crying, and my Freddie grabbed my hand tighter. She let me get up to go change my clothes, I felt broken inside. She was kind enough to take my daughter Kameron with her so that Freddie and I could be alone. I came out the bathroom and wrapped my arms around Freddie and sobbed. All our plans and joy were over in that moment. We then had to meet with the doctor to discuss what was to be done now. My doctor is truly the best doctor I have ever had. She held my hand, she hugged me and we talked about what process I would choose. At this point my body had not given me any indication that something was wrong. She told me I could wait for my body to do it on my own, I could take pills to help the process or I could have a surgical procedure. I didn’t want to wait, and I didn’t want surgery. I chose the pills. I didn’t want to be alone when we officially lost our baby, and with Freddie being off I figured this was the best choice. The hardest part for me was telling my family and friends that we had lost our baby. They were just as excited about this beautiful gift as we were. I also didn’t know how to respond to their sympathy. What did I say? Did I say it was okay and that I was okay? I wasn’t okay, I was lost. I was so full of questions, questions that can’t be answered. Why did this happen? What went wrong? Am I a mother of 2 even if I will never meet this baby? I didn’t understand why this was happening to me. 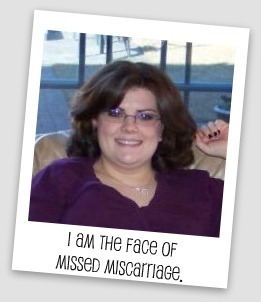 I didn’t want to be part of a statistic of 25% of all women that will have a miscarriage. I just wanted to be happy and to look forward to my due date. I had prayed that my baby would grow and have a strong heartbeat but my prayers weren’t answered. Why weren’t they? I will never know, but I do know that God has a plan in everything. At this point I had to mourn my baby. But how do you mourn someone that you have never met? I was already so in love with this little person, and I didn’t even know what he/she looked like. I had to say goodbye, but I didn’t know how. The only thing I knew to do was to cry, so I cried. And while I cried, Freddie held me. I couldn’t have made it through this without him. Somehow he knew what to do and what to say. He was truly the rock of support I needed during this whole ordeal. My ordeal is not over, but I can’t live in a world of mourning. Despite what has happened I am still blessed. I have a wonderful husband, a beautiful daughter and supportive family/friends. Three days later and it doesn’t hurt as much. I still hurt, but I don’t feel broken. I feel healed inside. Through my tears, through the love of family and through God I am healed. So sorry for your loss. It's kinda crazy how somewhat similar your loss and my first loss were. I also had a missed miscarriage at 10.5 weeks, which was diagnosed on March 2nd and I had a d&c on March 4th. It is just awful that any woman has to go through such pain and heartache. But it is good that you have so much support to help you through. My name is also Rian. I think I have only met only one other person named Rian who spells it the same way!! Wow! I too have never met someone with my name that spells it the same way! I am so sorry for your loss….this is such an ongoing journey of pain,mourning and healing. I hope neither one of us ever has to go through this again!